Eden Villa Retirement & Assisted Living provides an environment that offers opportunity for growth and development giving purpose to those who reside at Eden Villa and builds on relationships and companionship both existing and new. Eden Villa dietary cooks provide nutritious, well balanced meals and snacks throughout the day to keep you feeling your best. The dining area is brightly lit with a skylight and windows overlooking the courtyard. During cooler months residents enjoy dinner by the fireplace and in warmer weather a nice fresh breeze through the windows. Therapeutic diets are available on consultation upon arrival. Family and friends are welcome to stay for meals. As a courtesy to the staff we just ask that you please offer notice that you are coming and a small charge may apply. Our large open dining area, courtyard and outdoor green space are all perfect for celebrations such as birthdays, anniversaries, family reunions and Special Events and Holidays. Active Health Management provides Physiotherapy at no cost to the resident 3 times weekly for individuals and in a group setting. Pain Therapy is also available for those in need upon assessment and referral from Physician. Eden Villa Residents and volunteers enjoy games and crafts, movie nights, gardening, walks through the private courtyard and secluded neighbourhood and … simply resting on a private bench and enjoying time with friends and family. We are located only a few blocks away from Historic Downtown Chatham, where residents can enjoy shopping, going to the theatre and galleries, festivals in the park. Eden Villa’s private rooms were created with a vision of accommodating a variety of needs. Each of our beautiful 27 rooms offers large windows, flooding the rooms with natural light and picturesque views of our 5 acre surroundings. 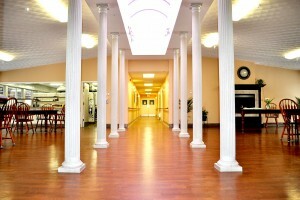 Temperature in each suite is managed by the individual resident to best accommodate personal needs. Each room is decorated with personal belongings to suite resident’s individual tastes and comes with large closets and private bathrooms. (Some furnishings are available for those in need.) The rooms are pre-wired for phone, cable and internet connections. Our 24 hour staff can be easily reached through our emergency call bell system, available to every resident. In order to ensure the safety and security of each of our clients we provide a smoke free environment and each room is equipped with a fire alarm and sprinkler system. Eden Villa is a secure environment for residents with mild cognitive impairment. We offer ample parking for our residents, their friends and families that is wheelchair accessible.